The behavior of dielectrics in electric fields continues to be an area of study that has fascinated some curious minds including physicists, electrical engineers, material scientists, and more recently, biologists. But what is dielectric? A dielectric is an insulating material with a poor conductor of electricity but with the ability of store electrical charge. They are the exact opposite of conductors, so they are often called insulators. The behavior of dielectrics in electric fields is a fundamentally unifying approach based on the principles of physics and engineering. A much broader approach is needed to best understand dielectrics. 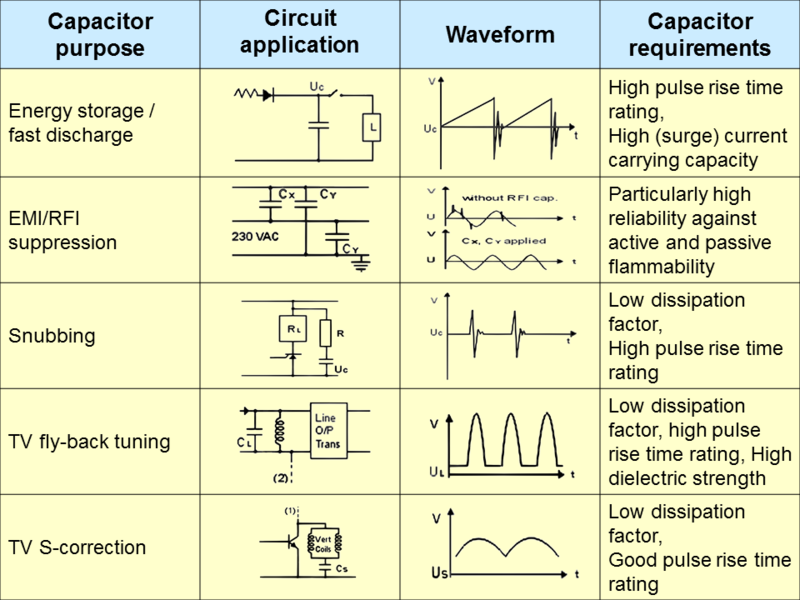 The key electrical properties of interest here are dielectric constant and dielectric strength. The dielectric strength of an insulating material is its ability to act as an insulator. As the name implies, dielectric strength is the maximum voltage that a material can withstand under ideal conditions up to which no electrical breakdown occurs in that material. The dielectric constant of an insulating material, on the other hand, is the ability of an insulator to store electrical energy. In many applications, insulating materials are required to perform as capacitors. Such applications are best served by plastic materials having a high dielectric constant. But the question remains, is dielectric constant the same thing as dielectric strength? This article explains the key differences between the two quantities. Alternatively referred to as relative permittivity, the dielectric constant of an insulating material is a quantity measuring the ability of the material to store electrical energy in an electrical field. The dielectric constant is the relative permittivity of a dielectric material. 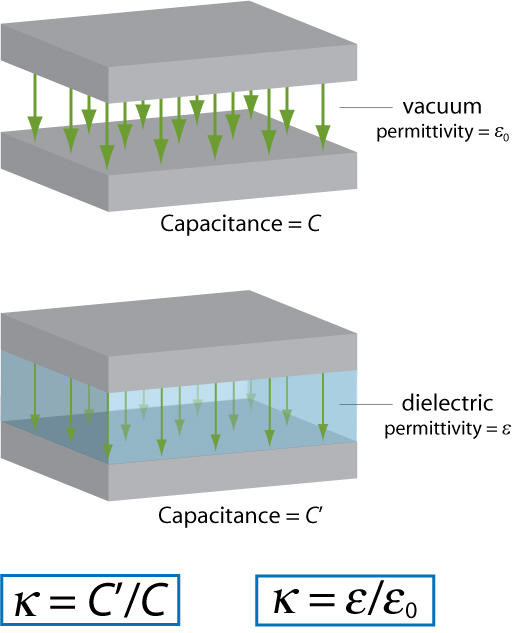 To define the permittivity of the dielectric medium, the vacuum or free space is considered to be a reference medium. So, relative permittivity of vacuum with respect to itself is unity. The dielectric constant is defined as the ratio of electric flux density in a dielectric medium to that produced in a vacuum by the same electrical field strength under identical conditions. In other words, the dielectric constant is the ratio of the capacitance of a capacitor with an insulator placed between them to the capacitance of the same plates with a vacuum between them. Simply put, the dielectric constant is the ability of an insulating material to store electrical energy. In physics, the dielectric strength of an insulating material is its ability to act as an insulator without losing its insulating properties. It is a measure of the electrical strength of an insulator expressed in terms of volts per unit thickness (V/mil). The dielectric strength is defined as the maximum voltage that can be applied to an insulating material before it goes into breakdown or loses its insulating properties. The dielectric strength is the maximum intensity of electric field a material can sustain without breaking down. All insulators allow a small amount of current to leak through or around themselves, but only a perfect insulator, if there is such in existence, can be completely free from small current leakage. It is a fundamental characteristic of an insulating material. The higher the dielectric strength, the better the quality of an insulator. – The dielectric strength of an insulating material is its ability to act as an insulator. As the name implies, dielectric strength is the maximum voltage that a material can withstand under ideal conditions up to which no electrical breakdown occurs in that material. The dielectric strength is defined as the maximum voltage that can be applied to an insulating material before it goes into breakdown or loses its insulating properties. Also referred to as relative permittivity of a material, the dielectric constant is the ability of an insulating material to store electrical energy. – The dielectric constant is the relative permittivity of a dielectric material defined as a quantity measuring the ability of the material to store electrical energy in an electrical field. It refers to the ratio of electrical field under ideal conditions to that produced in any medium. The dielectric strength, on the other hand, is a measure of the electrical strength of an insulator expressed in terms of volts per unit thickness (V/mil). The higher the dielectric strength, the better the quality of an insulating material. The relative permittivity of vacuum with respect to itself is unity. – The dielectric constant of a material is the ratio of permittivity of that material to permittivity of the free space or vacuum. Because dielectric constant is relative, it has no units or dimensions. The dielectric constant of a material is simply represented by numbers. It is often called as relative permittivity and the SI unit of permittivity is Farad per meter (F/m). The dielectric strength is a measure of the electrical strength of a material as an insulator and is expressed in Volts per unit thickness. The SI unit of dielectric strength is volts per meter (V/m). In US customary units, the dielectric strength is expressed in volts per mil, where a mil is 1/1000 inch. The dielectric constant is the ability of an insulating material to store electrical energy in an electrical field. Also referred to as relative permittivity of a material, the dielectric constant is the ability of a material to concentrate electrostatic lines of flux. Because dielectric constant is relative, it has no units or dimensions. It is simply represented by numbers. The dielectric strength is the maximum voltage that can be applied to an insulating material before it goes into breakdown or loses its insulating properties. The SI unit of dielectric strength is volts per meter (V/m). Sagar Khillar. "Difference Between Dielectric Constant and Dielectric Strength." DifferenceBetween.net. 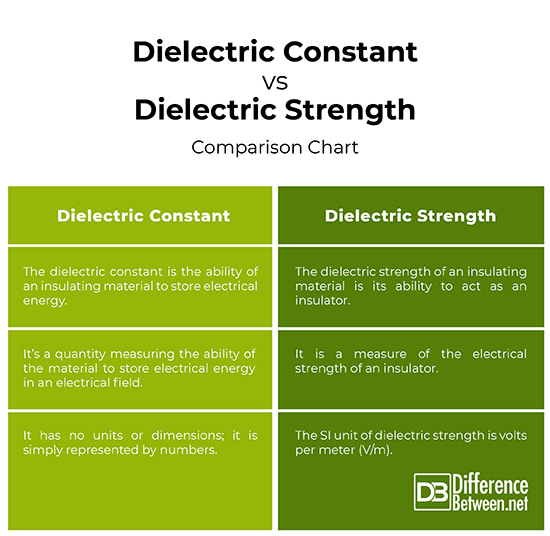 April 1, 2019 < http://www.differencebetween.net/science/difference-between-dielectric-constant-and-dielectric-strength/ >.